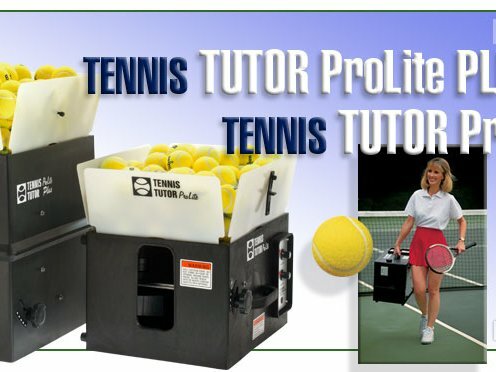 The Tennis Tutor ProLite is a full-featured professional ball machine, yet it stands only 12 inches tall and weighs less than 30 pounds. Patented technology borrowed from the world's #1 portable ball machine, the Tennis Tutor, makes it possible. Tennis Tutor ProLite is available in both AC and battery-powered models. Please note the Pro-Lite machines do not have wheels for transporting and should only be moved without balls in the hopper. - New! Now includes smart charger. - Five-second Set-up. The ball hopper opens in seconds to hold 125 tennis balls. Just load the balls and you're ready for action. - Versatile Speed. Ball speed is variable from a gentle toss that's ideal for kids just beginning tennis, to hard-hitting groundstrokes that will challenge even top amateur players. - Variable Ball Feed. Ball feed rate is variable from one ball every 1-1/2 seconds (for quick-reaction volleys), to one ball every 10 seconds. - Start-up Time Delay. A start-up time delay allows the player time to get to the other side of the net before balls begin shooting. - Full Range of Trajectories. Ball trajectory is manually adjustable from groundstroke to lob. - Full-Court Oscillator. When you're ready to hit on the run, just flip the oscillator switch and Tennis Tutor ProLite will deliver shots randomly across the court. - Warranty Tennis Tutor ball machines are backed by a three year warranty covering both parts and labor. Extended warranties available. -Item is Drop Shipped and cannot be shipped outside the contiguous United States due to shipping costs. -Please allow 1-3 days for processing before item will ship. -No C.O.D payments for this item. The comfort bill construction reduces pressure against the forehead, reduces weight and improves moisture management. Quick-adjust back closure for secure, one handed on-the-fly adjustability. woosh design trademark at the front, and Swoosh design trademark at the back strap. Genichiro Sanada (真田 弦一郎, Sanada Gen'ichirō) is a fictional character in the anime and manga The Prince of Tennis.